Today, beloved and I had lunch at Oki Oki. This Japanese restaurant has been at the main entrance of Trinoma ever since the mall’s incarnation as far as I can remember. However, all these years, we never ate there. Why? Perhaps because it eludes an unappealing atmosphere from its shabby interiors and unwelcoming look. The number of customers we find eating there wasn’t enough to sway us in as well. Even though it never seem to have a lot of customers, even after all these years, this particular restaurant is still there. Finally, after the said years pass, we finally mustered enough courage to try it out. We did manage to take a peek at their menu before coming in, and we did see that their prices were comparable, maybe a bit more expensive to other Japanese restaurants we’ve tried. Their menu is also a bit laughable, with a lot of spelling mistakes and inserted messages I can only guess were pranks played by the menu encoder. They do boast they serve the “largest tempura in town”. Seeing that message, I was inclined to try it out. However, I also wanted to try out their other stuff, particularly their sashimi, and their menu basically has every Japanese dish you can think of. 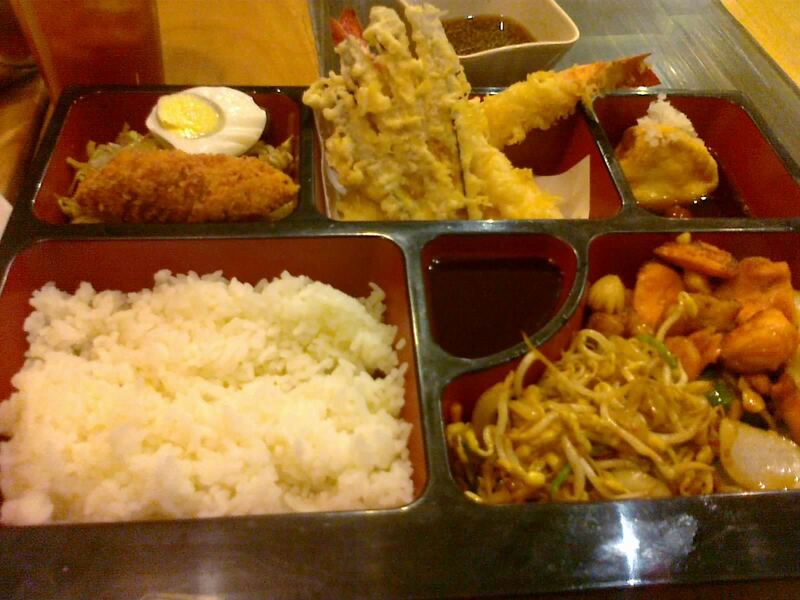 Luckily, they do serve bento boxes which comes with tempura among other stuff, with your choice of main teppanyaki dish. So I ordered their Executive Bento C (495 Php). 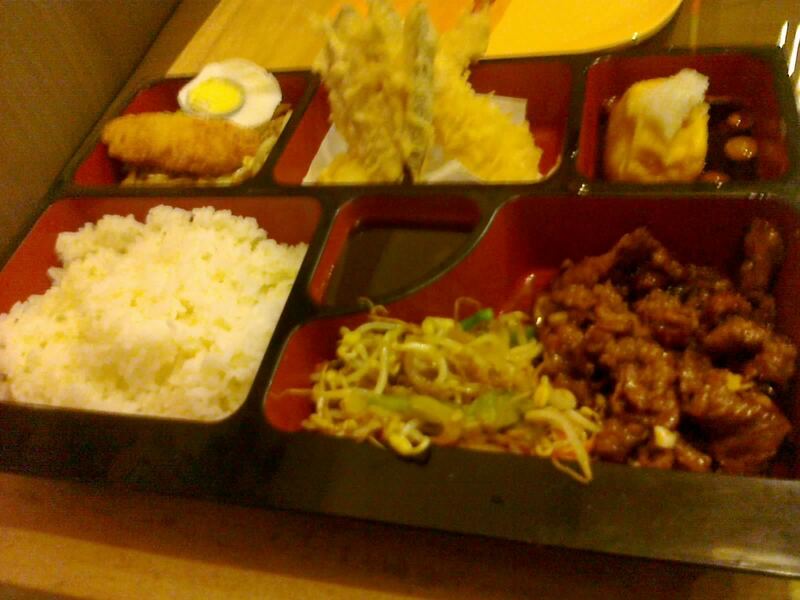 Beloved had a bento box as well, their Executive Bento B (380 Php). As for our drinks, beloved had their Refillable Iced Tea (80 Php) and I had a pot of their Hot Green Tea (50 Php). The main difference between our bentos was the sashimi. Beloved’s order doesn’t have any. 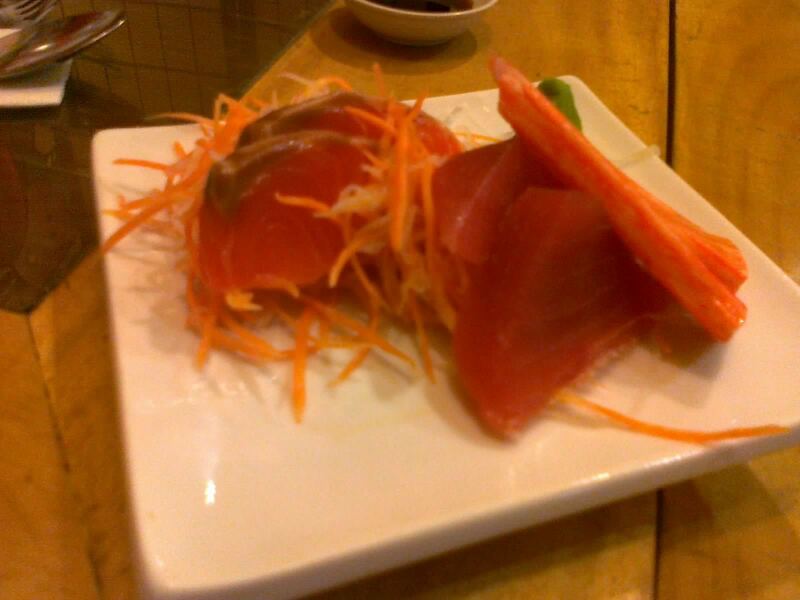 Mine had a couple of slices of tuna, salmon, and kani sashimi. The tuna slices were pretty thick, although they weren’t really the freshest I’ve had. The salmon was noticeably thinner, but was pretty creamy because of the fat. The kani was saltier than your usual crab sticks, and also came in long slices. If you calculate, this plate would be 115 Php, which I guess is okay. After a short wait, our bento boxes came. Despite the pretty expensive price tag, they do boast a large variety of dishes in generous quantities. It had, from the top left clockwise, yakisoba, potato korokke, half a hard boiled egg, vegetable (eggplant) tempura, a couple of pieces of ebi tempura, agedashi tofu, beef teppanyaki, mixed vegetables, and rice. Not pictured was a bowl of miso soup. Beloved’s bento had the same stuff in the same quantities in it, except hers had seafood teppanyaki instead. The entire bento is good for one very hungry person or two not so hungry people, which somewhat justifies the price tag, although I still frown a bit upon it. I though perhaps I can find the reason in the taste of their dishes. Everything was okay, I guess. If you’ve eaten any of these dishes before, you can probably find the expected tastes and textures. Nothing was quite exceptional taste-wise. Their tempura, although wasn’t the “biggest” I’ve had, might indeed be the longest I’ve eaten. It was maybe an inch longer than your usual tempura but it still tasted the same. The agedashi tofu had the expected sweet taste, and was swimming in a mushroom-soy sauce. I found the mushrooms to be cute because of their size, but really did nothing much to the dish. The croquette was quite delicious and wasn’t at all oily. Our main dishes were okay; mine had a very sweet taste coating the beef, maybe a bit too sweet; beloved’s was good as well, especially in terms of the variety of sea meat in it. The vegetables were vegetables, though I do like the fact that they added some bell peppers which is usually absent in your usual mixed veggies in your usual bento. I ended my meal with their miso soup, which was still hot even though I saved it for last. It had your usual stuff mixed in—tofu, leeks, and nori—and made for a soothing punctuation of a very filling meal. So does the taste justify the price tag? Nothing was bad for one thing. But, no, I still find it a bit too expensive simply because nothing stands out except for the length of the tempura. Sushi-Ya boasts a similar bento box at almost half the price. While I do find the tempura here quite superior, I still think the price of the bento was off by 50 to 100 Php. However, I do like the variety, and I do realize why this restaurant is still alive despite its seemingly low customer count: none of their dishes are bad. You basically can’t go wrong here. They have good food in generous quantities with a price tag off by about 10%. If they fix the prices, or at least the ambiance of the place, I might frequent the place. Until then, this is just another Japanese can’t-think-of-a-place-to-go restaurant in my list, certainly worth a try. Location: 1st Floor, Trinoma, near the main entrance. Smart nomnomnom tip: Their bento is pretty good for variety.